Life-changing wisdom never goes out of style! These eight classic works have truly stood the test of time, selling tens of millions of copies and remaining in constant demand. 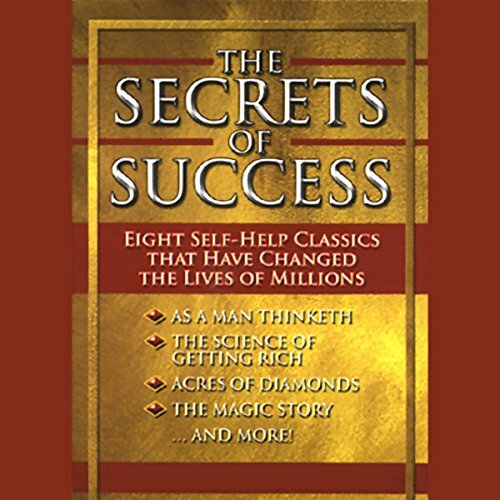 Now The Secrets of Success, a one-of-a-kind anthology of achievement, reveals why they are every bit as inspiring as they were a century ago. Here are the masterpieces of success and motivation that have influenced and earned the praise of Brian Tracy, Tony Robbins, Denis Waitley, and many other self-help giants. Listen to such landmark books as The Science of Getting Rich, As a Man Thinketh, and The Magic Story, and you will believe you are truly hearing the secrets of the masters, speaking to you from a hundred years ago. Reflect on the messages of Acres of Diamonds, The Majesty of Calmness, and The Greatest Thing in the World, and you will feel equipped to master the challenges of modern life with the wisdom of the ages. (P)2005 Gildan Media Corp. All rights reserved. Great Books, Poor Narration. The narrator will go off in monotone for paragraphs at a time, then start mumbling. The information in the books are definitly jewels, but hard to get past the narration. It was a great treat to find that the books recommened in the movie The Secret here on audible.com. In keeping with the overall theme of these books, you should embrace the concepts put forth by these writers. The concepts are clearly and faithfully presented. These books are not New York Times best sellers with murder, mayhem, and mystery, and along those lines, they are read appropriately. I for one, was not looking to be "entertained" by the reading, but to gather more information. What you will hear is wonderfully solid books with straight forward concepts and values that can be translated into day. The reading is just fine; the reading doesn't need to be exciting because the concepts presented are very exciting, and you don't need to be entertained to absorb the teachings being given to you through the books. The content is much more important; what is in the box is far more important than the wrapping. I highly recommend these books regardless of using a book credit. The Wallace Wattles portion is worth the price of the whole set, although you can buy it as a single book. The narration takes classics and turns them into boring information. Buy the books -- read them yourself -- the information is good, the delivery is awful. Don't buy it. Very bad performance! The voiceover is very poor. He reads very fast, without any inflexion or emotion. These are great classics but the performance is so bad that it is almost imposible to hear. The reading of The Science of Getting Rich was painful to listen to. Really terrible. Although the narrator's voice is lacking in passion and is a bit monotone, the wisdom of the books under this title is priceless. I've listened to the stories over and over again and have benefitted greatly! Although the books included in this audio are classics, the narration is poorly done. It is as if you'd asked your brother, who has no interest in these titles, to read to you while you drive. A great collection of rich content. Regarding earlier comments about the narrator--I like him because he reads without trying to win an academy award for acting. Perfect for being read to sleep at night. He reminds me of the Radio Reader on PBS, or a hypnotist. A good way to get these ideas into your subconscious mind where they can do some good. Where does The Secrets of Success rank among all the audiobooks you’ve listened to so far? What about various’s performance did you like? What insight do you think you’ll apply from The Secrets of Success? if you are a reader of "the secret", the art of getting rich is the book reflected by Rhonda Byrne in the beginning as the real book that opened her mind and she read in one sitting!! Love it !! The books listed on this recording was phenonmenal. I listen it while you drive. An amazing collection of wise words. I've studied all of these audios and none have disappointed. well worth the money. The most inspiring books (five stars) exposed to the dullest, almost yawning reader (one star) made me postpone listening to the audio for months. Now, after listening, I do appreciate the books and even - after a few hours - got used to the reader. Glad I bought it, after all, but would definitely consider buying another version, should a more vivacious reader be found.